I am a big fan of the celebrity super chef Heston Blumenthal. Aside from his crazy culinary creations one of the things that draws me to him is his obsession with the history of food. If you watch pretty much any of his programs you will see that he is continuously inspired by recipes from the past (for example check out Heston’s Feasts for some culinary masterpieces). When I started working in this field many years ago, Heston’s approach inspired me to look at visualizations created in the days before computers – when pen, ink and imagination reigned. Is there anything from the past that we can draw inspiration from today and take real, key lessons in our approach to visualization design? The answer is of course yes! Of the hundreds of potential candidates I want to take a look at the three most (in my opinion) seminal examples. 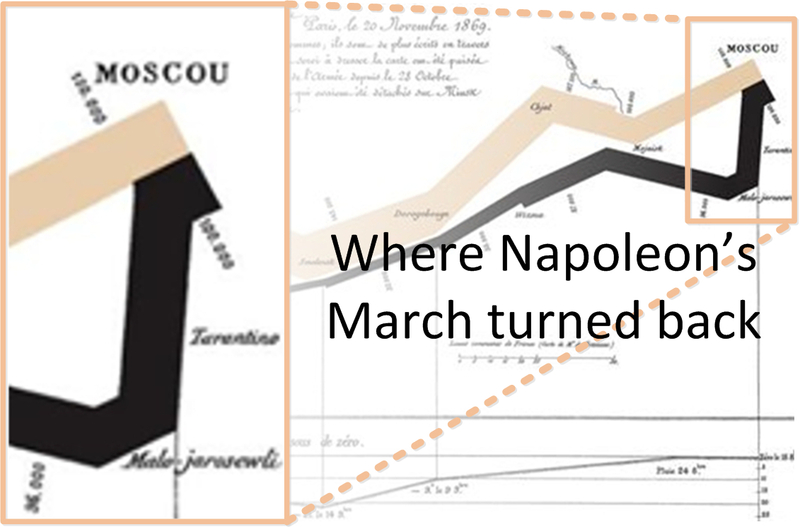 This first blog post will take a look at the most iconic of them all, Minard’s visualization of Napoleon’s “March to Moscow”. Charles Joseph Minard was a French civil engineer who was a pioneer of information graphics. Mindard created many statistical illustrations but his most well-known is of Napoleon’s disastrous Russian campaign of 1812, the famous (or infamous) “March to Moscow”. The American statistician and data visualization guru Edward Tufte in his book “The Visual Display of Quantitative Information” has notably commented that this is one of the “best statistical drawings ever created”. 2. Change over time without a linear time axis – the ability for Minard to represent the change in this data over time (e.g. 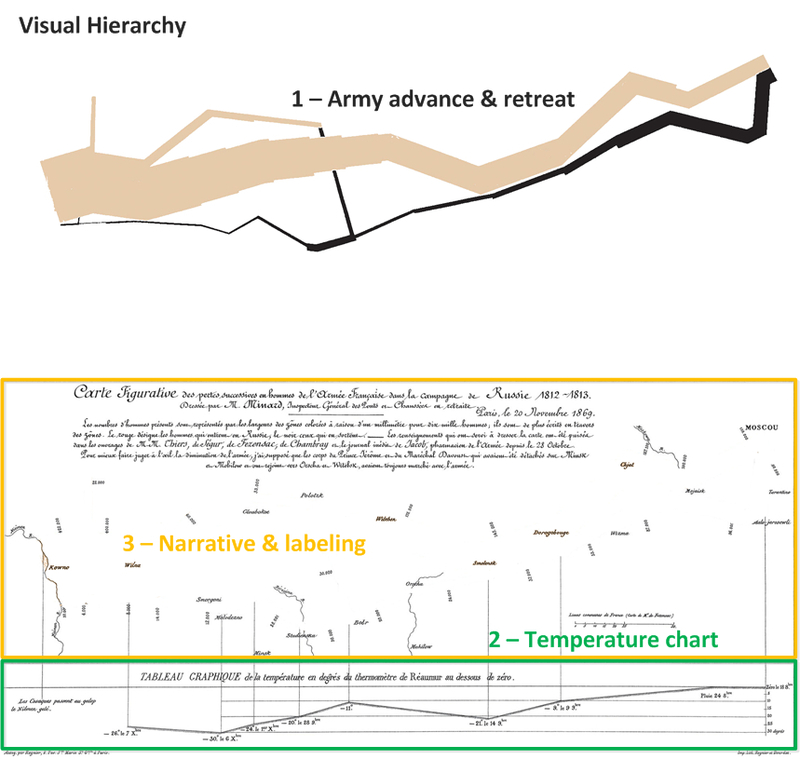 loss of troops, change in temperature, change in location) in a non-linear but intuitive way. 3. The minimal use of colour – only using two colours has a number of advantages, for me one of the things this does is to allow the reader to quickly identify a key inflection point in the story – specifically the location where Napoleon’s army turns back to march home. 4. The abstraction of location – Although the map is geographically accurate, Minard was able to clearly show movement around a geography without requiring an obvious map layer which could end up being very distracting (see overlay graphic below). This allows the eye to focus on the story but by leaving in key pieces of geographical information the reader is not disoriented and always knows where they are. 5. Intuitive Visual Hierarchy – Minard created an obvious visual hierarchy that allows the reader to absorb information at different levels very quickly. Our eye is immediately drawn to the advance and retreat shape and colour, it naturally drops down to the temperature and finally labels and narrative come into focus. For me the only really distracting item is the large amount of text top middle but I think Minard got away with it! 2. Abstraction of magnitude – Minard manages to convey changes in size of the army using the relative width of the two coloured shapes as well as its direction and location. Yes labels are there for temperature, date and locations BUT these are supporting elements that come further down in the visual hierarchy. The reader can make sense of the elements of the story without having to mentally process numbers in their mind.